I’ve received my first Amlogic S912 TV box with MXQ Plus M12N TV box this week-end, and I’ve decided to start testing by showing the media capabilities of the platform that is supposed to support 4K VP9 up to 60Hz, 4K 10-bit H.265 up to 60Hz and 4K H.264 up to 30 Hz. The results are pretty good as the two main “failures” were expected since Amlogic S912 video processing unit (aka hardware video decoder) does not support 10-bit H.264 nor 4K H.264 @ 60 Hz. 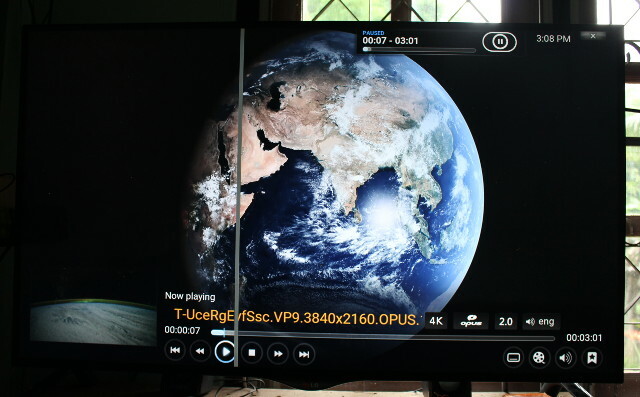 The Curvature of Earth video was watchable, but I think I’ve seen it play more smoothly on other hardware platforms. I initially started to play over SAMBA, but the Fast Ethernet network performance is not always good enough to play the videos from a SAMBA share, so I reverted to using a USB hard drive. [1080p][16_REF_L5.1][mp3_2.0]Suzumiya Haruhi no Shoushitsu BD OP.mkv – Subtitles OK, audio may cut from time to time, and video is playing but a bit choppy, and with artifacts at times. So the processor is not quite fast enough to play 1080p 10-bit H.264 videos despite all eight cores being used at the time of playback. You can watch all videos above being played in M12N TV box, and download them from comments @ Where to get Video & Audio samples. I also tested HDMI audio pass-through, but only Dolby and DTS options are available in that version of Kodi, with DTS-HD and TrueHD options missing, and Dolby 5.1 and DTS 5.1 sometimes playing with audio cut. So that’s yet another TV box shipped without proper audio support. Automatic frame rate switching is not supported either. did you check if there was some throttling issues while playing the “1080p 10-bit H.264” video ? Passthrough problems like on the S905 and S905X. Great! Are there android tv box that can play 4k 10bit hevc smoothly? Now most of them can handle 4K 10-bit HEVC pretty well.